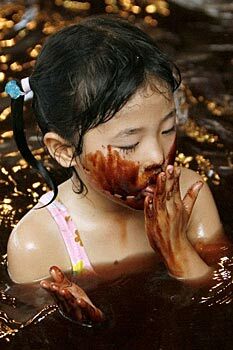 A couple enjoy a bath incorporating chocolate at a hot springs spa resort in Hakone, west of Tokyo, Feb. 9, 2007 in preparation for Valentine’s Day. With Valentine’s Day around the corner – flowers, chocolates and gifts shops are flooded with orders from lovers for their big day. But what’s happening at a spa in Tokyo sounds like not just lovers but a chocoholic’s dream. 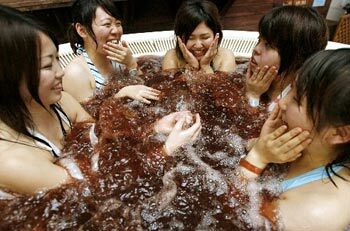 A hot springs spa resort in Hakone, west of Tokyo has incorporated a chocolate bath in preparation for Valentine’s Day. 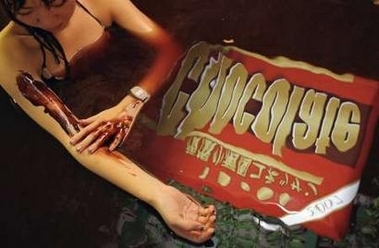 The bath containing cacao extract and trehalose has the effect of keeping moisture in the skin and producing beautiful skin, the resort said. Meanwhile, spas in Indonesia have also come out with offers for calming spa treatment side-by-side with your partner. A hotel in one of Tokyo’s wealthiest neighbourhoods, Akasaka, offers to cover a couple from head to toe in chocolate cream and aroma. This entry was posted on Monday, February 12th, 2007 at 1:33 pm	and is filed under Interesting Stuff, Wonderful Things. You can leave a response, or trackback from your own site.